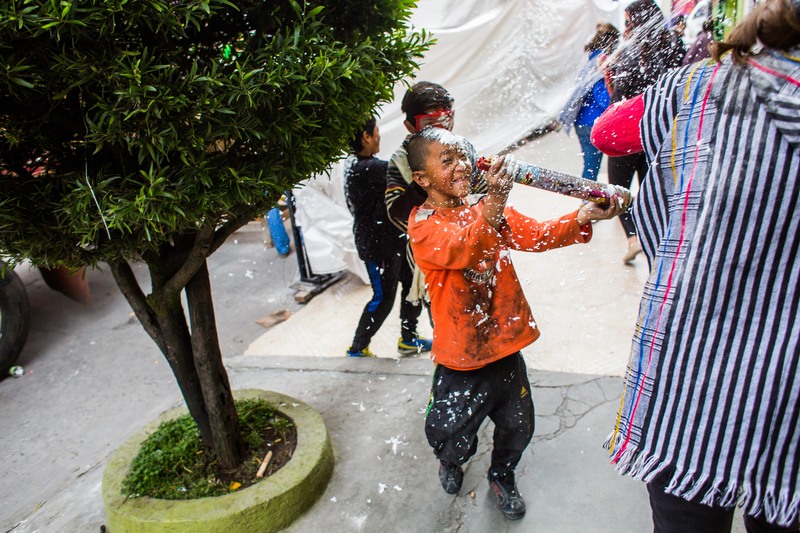 The Black and White Festival in the city of Pasto, Narino, Colombia is probably one of the most intriguing events I have ever attended. It has a long history as a series of celebrations from Christmas until epiphany on January 6th. The festivities culminate on the Day of the Blacks on the eve of epiphany followed by the Day of the Whites with a huge parade. The Day of the Blacks goes back to a proclamation of a “free” day where all slaves where to have a day where they were free to do as they please. I’ve read that because Pasto had such few slaves many painted their face black and that to show approval non-whites painted their face black. It’s an interesting tradition in Colombia that was based in race, but now seems to just be a free for all party where not even your 85-year-old grandmother would be safe. 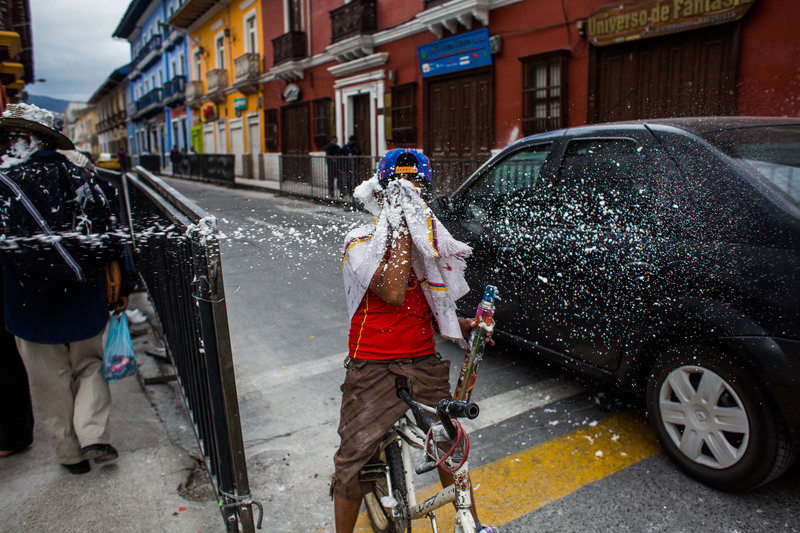 4-year-olds to grandfathers roam the streets with ‘cariocas’ or foam shooters, talcum powder and a rainbow of different colored paints and they all go wild. You’re not safe inside a building or amongst friends and when we took our photos with police they proceeded to shoot us with foam. Everyone wears a poncho and sunglasses (you simply can’t avoid it) and no one is above being attacked from behind and having a handful of paint slathered all over their faces. Sometimes people face you from in front they gently come up and gesture to you with a finger of paint, though those are the outliers and you view this politeness with suspicion as if at any moment their friends might attack from behind. 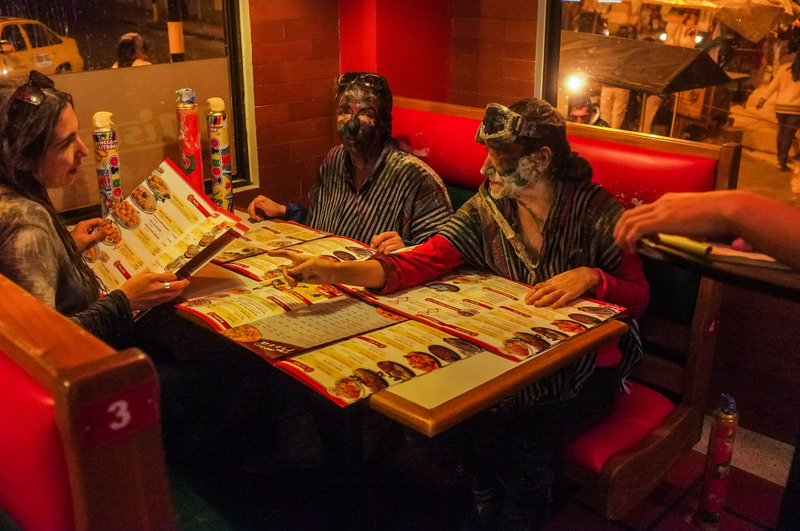 So we went out and bought cariocas (foam guns), paint, ponchos and Debra bought motorcycle goggles because the foam and talcum powder burn in your eyes and we headed down to the carossas, or parade floats. 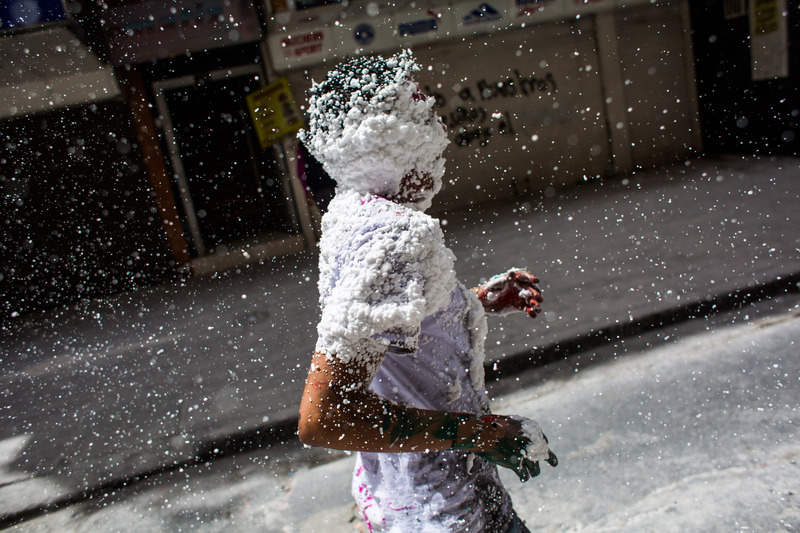 There were two near the city center that were preparing for the Whites Day (epiphany and the culmination of the major celebrations) when the parades head down their route and everyone gets covered in talcum powder. At the workshops we kept waiting for someone to tell us to get out of the way, but they welcomed curiosity as they painted, welded and worked like mad to put together the remaining floats. The tradition in Pasto has been for specific families to sponsor the building of floats, and according to people at both sites the artists are all volunteers from Pasto. It’s amazing to see the styrofoam/cardboard/neon airbrushed pieces that in a matter of hours would constitute a giant float we’ll all get to admire for just a few hours. After this we headed back, frequently attacked by small children and then taking it out on other small children. 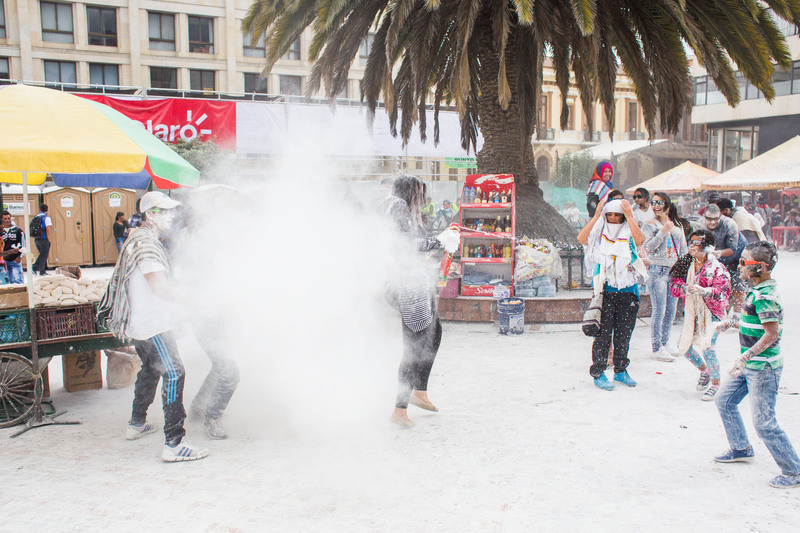 We made our way to Plaza Narino where it was truly chaos. The square was white as if in winter from all the powder on the ground. Some politely came up and asked to paint our faces while others just flat out massacred us. My sister was attacked below and I ran but that little kid below caught me anyway. We had some aguardiente at one of the many little bars that line the street only to be painted on by our neighbors and then offered whisky by Charlie. We were starting to look pretty ridiculous by that point, our ponchos soaked and covered in paint and our faces looked like muddy rainbows. We made our way to the carnival plaza which was the most ridiculous place I’ve ever been. 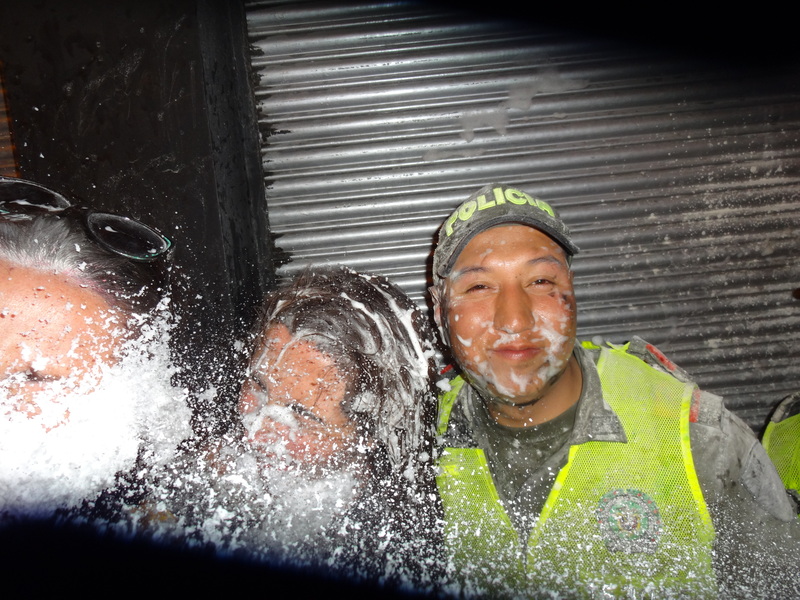 It was a free for all, you were not safe at the bar drinking your beer (which ended up being covered by foam and talcum powder) or in a group of people. Our neighbor repeatedly danced with us, bought us beer and his son surprised attacked us several times over. I switched from my 5D to the Fuji x100 as everyone was getting rowdier and you could see ‘mini wars’ happening all over the plaza. It felt like being a kid again. For a couple of hours we sat and drank beer, were attacked by instigators, attacked them back and occasionally shot someone walking by and repeatedly shot each other on accident. By the end of the night our foam was gone, so we resorted to paint and you know being 5’10” has its’ advantages as you can pretty well smear anyones face from behind. The culmination of my night was probably taking our sorry selves into a “Mr. Chicken” franchise (think Dennys) completely covered in paint, leaving residue everywhere we walked, and being politely attended to by our waiter as if it were no strange thing to serve four filthy ladies fries and pizza. Previous Stop the Killing Protest in Phoenix, Ariz.